The most educational swimming pool blog in the country, providing fiberglass pool articles and videos, as well as information on inground concrete and liner pools. How Deep Are Fiberglass Pools? Fiberglass pools come in many different sizes and shapes. 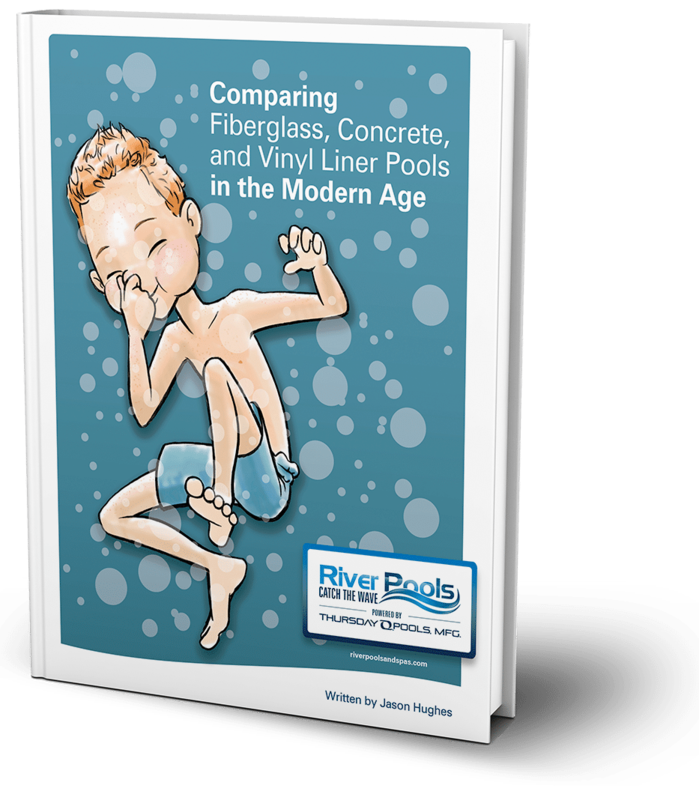 Back in the 1970s and '80s, you were limited in the selection of sizes and shapes of fiberglass pools. Fiberglass pools came in two colors, white and powder blue. But today there are a wide variety of fiberglass pools to choose from, including a wide variety of colors to pick from. This is due to more people getting into the manufacturing of fiberglass pools and the advancements that have been made in the gel coat industry. What's hot in the world of inground pools today? Here at River Pools, we help hundreds of inground pool clients plan and design their dream pools each year. This allows us to keep a pulse on the options, accessories, and features that are trending in the inground pool marketplace. And today we want to share this with you! Don't blindly wonder if a fiberglass, concrete, or vinyl liner pool is right for you. Our educational ebook does a deep-dive comparison of the 3 types, all while noting the advantages and disadvantages of each. Stamped vs. Brushed/Broomed Concrete for Swimming Pools: Which is Better? One of the biggest debates that pool shoppers have during the process of building their swimming pool is which type of concrete to use for their patio. There are many, many types of patios that can go around a swimming pool: brushed concrete, stamped concrete, pavers, stone, brick, overlays, etc. This article will solely focus on helping you to understand the pros and cons to brushed (aka broomed) vs. stamped. By so doing, you will be able to make the best choice for you and your family. I was at an appointment recently with a customer who asked a question that I've heard so many times before. In the midst of her struggle to justify a swimming pool purchase, this is what she said: It's a tough call, Marcus. We are just not sure if we should take the plunge... I just wonder if a swimming pool is worth the money we are going to put into it? Let me just say...if you’re reading this article, it’s pretty safe to say you have good taste. How do I know? Because if you’re researching pool coping, you already know you want something special. Am I right? I speak with pool shoppers in Virginia and Maryland, as well as across the country. One of the questions I'm most often confronted with: How big should our pool be? This is certainly an important question to ask. The pool's size and shape has no means of being pulled, stretched, or even shrunk after it's in the ground. The decision needs to be correct the first time, as there is no turning back. So how does one know what size to choose? How do I choose the right pool size for my family? Who are the pool's main users? How often will they likely use the pool? Does anyone plan on doing laps in the pool? How much patio would I like to have around the pool? What objects (grills, furniture, etc.) would I like to fit on the patio? What are the pool's setbacks off the house and property lines? How often do we plan on entertaining? What is the likely number of people at our gatherings? Will our family change size in the coming years? One of the big concerns about fiberglass pools is that they aren't "customizable" the way vinyl liner and concrete pools are—the pool shell itself is pre-made in a factory, and you're limited to existing designs. But in reality? Everything else is customizable, even down to the pool color and features. What you do with color, tile, elevation, water features, and more will dramatically change the look of your pool. River Pools manufactures and installs fiberglass pools every day, so we know quite a bit about this. Our designers work with each client to create a unique aesthetic that's perfect for that family. Take a deep breath with me, and think back on the last time you had extra money left over in your budget. Wasn't it great? For me, it was when I had euros left over at the end of my Scotland trip—can't use them here in the US, so I ran around the Glasgow airport with my girlfriend and spent them on overpriced souvenirs. The memory alone warms my heart. The spare money is especially great when your budget is for a big purchase, such as a house or, hey, a pool. Let's be real: when you're first nailing down the project, you pass on a few things that you secretly want, for the sake of Responsibility And Budgeting. But happy day! You can use this newfound wiggle room to pick up those super awesome things. Pools are a big investment, so we're discussing proportionally affordable add-ons—about $2,000 or less. Indoor Swimming Pools 101: Cost, Construction, Advantages, & More! So you're considering an indoor swimming pool? Great! Having worked on many indoor swimming pool projects ourselves over the years, we have found that people often have a variety of questions when they initially begin their research. Today, we are going to cover some of the most common questions we receive from our clients, as well as from folks around the world who find us via the internet. Let's jump right in! How Do I Make Sure My Pool Is Right for Me? Most people shopping for a pool think that they know just what they want. For example, 90% of the people who want a diving board think they need it. But after education on the pros and cons of a diving board, only 10% of those people will still get a diving board. You're spending a lot of money on this swimming pool investment. You expect that the person that you invite into your home will be an informed professional and have your best interest at heart. In reality the person who shows up will probably be a salesperson trying to earn a commission that will feed his family or lifestyle. That's what is in his/her best interest, not yours. All too often, the homeowner says, "I want a pool this size and a deck this big," and the salesperson quotes them on what they ask for. It's far easier to sell a pool when the homeowner knows what they want, so why rock the boat? That's the mentality of most salespeople today. The problem: in most cases, what the homeowner thinks they want, and what they really want, are two different things.